While I was out of town last week, my better half was keeping himself busy by installing crown moulding in our master bedroom and two bathrooms. Then he added a piece of shoe moulding to all of our baseboards to fill in the gap where from the carpet we tore out when we bought the house. He even had our painters come by to slap a new wall color up in our master bedroom. When that was finished, he replaced our mailbox since the old one was completely battered in our last hail storm. The moral of this story? I should really go out of town more often! The homemade wall flowers aren't leaving the room, but they are moving to another wall. I wanted to try something new behind the bed, but I didn't want to rush out and buy something right away. One of my friends suggested I try fabric on the walls, and I remembered I had these old Pottery Barn curtains my mom had passed down to me collecting dust in my linen closet. I actually had them hanging behind my bed in my old apartment before we got married, so I knew I liked the look. I asked the husband to hang them behind the bed and voîla, a whole new look! I think the curtains help break up the blue walls and also make the room feel taller than it really is. 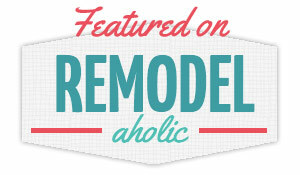 It was a simple, easy solution that gives the room a new vibe and didn't cost us any money. Can't argue with that, right? Have you noticed the new crown moulding in those pictures? Scott added some fancy touches in the corners that I really love. It makes our master bedroom feel more special than the other rooms, which is what I hoped to accomplish. It's a little more grand than our other rooms (if a small 1979 house can be described as "grand"). They carry this style of moulding at both Lowe's and Home Depot, if you're interested. Scott said that adding the corner pieces actually made all of the other moulding cuts easier, which is a nice bonus. Because we removed carpet throughout the house and installed resilient vinyl, we had a gap between the new flooring and the baseboards. To solve this problem, Scott added a shoe moulding to the base. We chose the shoe moulding instead of the base because it has a narrower profile. This small touch really helps the rooms feel finished. So far he has added it in the master bedroom and the two guest bedrooms. He'll be slowly working his way around the house, since almost every room needs that extra moulding piece. This is what it looks like in our hallway, where we haven't added the shoe moulding yet. You can see the small gap between the floor and baseboards. And here are the baseboards in the master bedroom, complete with the shoe piece. Looks much better, doesn't it? Just for fun, I took pictures of the room with different lighting to see how the new wall color changes with different light. We are really happy with our new wall color! This is just the first step to spiff up this room. As you can see, we have to work on decorating the other walls and figure out which furniture stays and what goes. The room will definitely keep evolving as we go along, just like the rest of our house. I will say that it looks much better than when we first moved in, don't you think? When I get impatient about an unfinished room, I try to remember how it started out when we bought the house two years ago. That usually makes me feel better and gives me the motivation to keep working on it! I hope you had a lovely weekend and have festive 4th of July plans coming up. There's nothing better than red, white and blue!